Hey guys, another productive day! 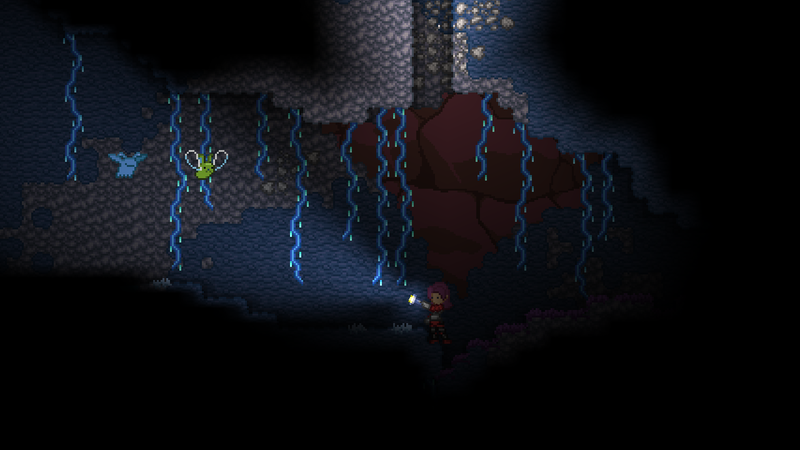 A whole bunch of new mini-biomes have gone in, especially in the underground. There’s a good bit of variety in the things you’ll come across as you work your way deeper and deeper, so there’s more to catch your interest while you’re looking for those more precious materials! Work on improving the combat has continued today, pretty much everyone on the team is really happy with where melee weapons are right now. One of the more significant changes that has come with the hitbox tweaks is that it’s now possible to take cover from projectiles behind walls that are two blocks high (so long as you remember to duck, anyway). This opens up some interesting tactical possibilities that I personally will be factoring into future dungeon design. Omni has been tackling a lot of GUI work under the hood, making preparations for some cool stuff coming up. Among these, our action bar is starting to undergo some changes and improvements, here’s a glimpse! The durability system Tiy described yesterday is almost completely finished, we’re in the process of balancing the life of the tools along with the amount restored by each of the ores. I feel it’s getting to a very good place right now, but further playtesting with larger groups is going to be key. As far as what I’ve been up to, I’ve spent a bit of time balancing and playtesting with the loot pools for our early dungeons. Speaking as someone who routinely would read patch notes for other games to glimpse the mentality behind certain changes, it’s an interesting turn being put in the position of the designer and making those same kinds of balance considerations. Chiefly it’s a matter of assessing how much loot a player should get out of a dungeon and what the odds should be for particular kinds of loot, especially the rare novelties we’d like players to be able to find, but without making it so common that it loses any significance. The feedback from the rest of the team has been encouraging so far! I leave you tonight with this snapshot I grabbed when we were playtesting the durability!